Two people were injured Friday when a DART paratransit bus collided with a car and started a five-vehicle chain-reaction crash, DART officials say. The crash took place in the southbound lanes of the Dallas North Tollway near Oak Lawn and Harry Hines at about 2:30 p.m. 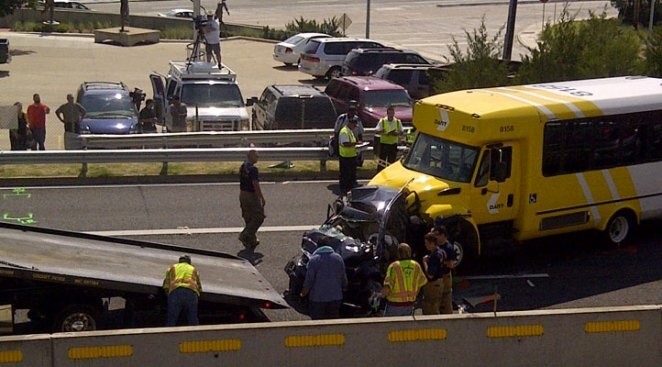 According to DART, the driver of the paratransit bus didn't slow down with surrounding traffic and slammed into a car, which led to a 5-vehicle chain-reaction crash. Dallas Fire-Rescue extricated at least one person who was trapped in the car hit by the bus and transported him to an area hospital. Officials with DART said a second person was also hospitalized. Neither of the injuries are life-threatening. DART's paratransit vehicle had no passengers on board at the time of the crash. The bus driver, a contractor employed by Veolia, is on paid administrative leave pending the outcome of an investigation, DART said. All southbound lanes and one northbound lane of the tollway were closed while the scene was cleared. Drivers in the area should expect significant delays.